Taking care of baby’s gums and teeth should start as early as possible to promote a lifelong commitment to healthy dental habits. However as many parents will concur, it can prove a little difficult at times! With this in mind, Dreambaby® has just launched the Three Stage Baby Gum & Tooth Care set, to help parents establish a daily oral hygiene routine with their baby from about three months of age. Dreambaby® Three Stage Baby Gum & Tooth Care Set is available as a convenient pack of three brushes, graduating with your developing child. The Stage 1 Brush is ideal for babies who have or who are just about to start teething. This brush consists of a textured rubber end, with no bristle, to gently massage sore and tender gums. A soft, slow rubbing motion on your baby’s gum can alleviate the intensity of the “teething” stage, whilst preparing baby for the next stage of toothbrush. The Stage 2 Brush is designed for the developing teeth stage, when crevices are starting to form on the gums, as teeth begin to erupt. Again, this brush is intended for gently brushing and stroking of the gums, whilst the small rubber points work to clean gums, tooth rims and new tooth areas. The Stage 3 Brush is the perfect “first” real toothbrush for your baby. The gentle bristles ensure great oral hygiene for developing teeth, every morning and night. This stage is the most important; to ensure younger children enjoy teeth brushing, and to start them on their journey to maintaining their own developing teeth and mouth. All three toothbrushes in the Dreambaby® Three Stage Baby Gum & Tooth Care set have an ergonomic grip handle to encourage your toddler to learn correct brushing techniques, by holding the toothbrush comfortably and confidently each time they brush their teeth! Oral care is invaluable for your developing child. The best approach is to start as early as you can, be gentle, stay committed and encourage your growing child, each step of the way! Dreambaby® Three Stage Baby Gum & Tooth Care set is available in a set of Blue and a set of Pink. 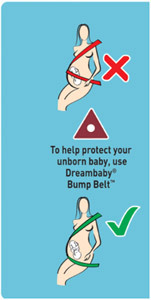 Thanks to Dreambaby here is your chance to win one of 10 x Dreambaby® Bump Belt™. FOLLOWING ON FROM THE SUCCESS OF THE ORIGINAL AWARD WINNING BUMP BELT™, DREAMBABY® LAUNCHES AN UPDATED VERSION FOR 2013. OFFERING SUPERIOR SEAT BELT COMFORT AND ADDED PROTECTION FOR BOTH EXPECTANT MOTHER AND CHILD WHILE DRIVING, THIS NEW DREAMBABY® BUMP BELT™ GIVES REAL PEACE OF MIND. Recently selected for a TOP CHOICE award by the prestigious USA based Creative Child Magazine, the NEW 2013 version provides even more safety and comfort. A most fabulous new feature is the addition of NON-SLIP DOTS, to further prevent the Dreambaby® Bump Belt™ and seatbelt from slipping up over your bump, ensuring your seat belt stays in place, whether you’re a driver or passenger. The Dreambaby® Bump Belt™ new colour is BLACK, to match most new cars’ interiors by blending discreetly and stylishly into your seat belt arrangement, the Bump Belt™ is an important safety buy for all mothers-to-be. Car travel has its risks. All accidents and minor incidents can be a problem for anyone but if you’re pregnant it’s doubly dangerous as a seat belt can exert extreme pressure against the abdomen, potentially damaging the uterus and resulting in injury and even miscarriage. If you or the driver is forced to break suddenly or you experience a low speed impact from behind, you can be pushed forward with unforgiving force. Accident statistics confirm that unborn children can be harmed when the seat belt is positioned incorrectly over the mother’s abdomen. Internationally, it is now standard practice for obstetricians and GPs to advise pregnant women to wear seatbelts under their ‘baby bumps’ as opposed to across their abdomens. The addition of a Dreambaby® Bump Belt™ with the specially designed non-slip dot surface can certainly prevent the lap strap from riding up, therefore reducing the risk of injury to the unborn child. Effective in encouraging Mothers to position and maintain the lap portion over the hips rather than the abdomen. Effective without affecting the structural integrity of the seat belt. “It’s about providing a sense of security,” explained Carolyn Ziegler, co-founder and Product Development Director at Dreambaby®. All mothers know pregnancy can be an anxious time. The Dreambaby® Bump Belt™ has been developed to provide mums-to-be real peace of mind, allowing them to enjoy their pregnancy to the fullest,” comments Ziegler. The new Dreambaby® Bump Belt™ is suitable for use for expecting mothers from two months pregnant right until the baby is born. Available Baby bunting and other good baby stores, Toys R Us and selected pharmacies nationally. Visit the Dreambaby® at www.dreambaby.com.au or call (02) 9386 4000 or in New Zealand, call (09) 274 8788. Come and visit the My Family Club Competition to win £100 worth of Dreambaby® products. Playgroup QLD for children is a time for fun and laughter; for play and development; for appropriate risk taking and problem solving; for spending time with significant adults. Playgroup for parents and other adults is a chance to catch up with friends; a time to spend quality time with children; a time to learn about child-raising from others who have older children; a time to learn about the risks that children take and how to minimise injuries while encouraging skill development and understanding. Wherever we go and whatever we do there are always risks for ourselves and children in our care. At Playgroup we need to consider how to minimise the negative outcomes that can result from the hazards we encounter. Each year Playgroup Queensland asks each Playgroup to complete a Feel Safe and Secure Checklist as a guide to assessing the safety aspects of each Playgroup venue. This checklist asks you to look around your venue and to identify what and where there might be hazards and to make decisions about how you will minimise the risk of injury or accident to those in your group. Have you completed this Checklist yet for 2013? The Checklist is available on the Playgroup Queensland website in PlayLink which is accessible to all PGQ members through the member login tab. Please complete this checklist if you have not yet done so this year and return it to PGQ so that we continue to keep our high safety standards. A playgroup member in one of our Brisbane suburbs highlighted a few concerns she had and we found ourselves in need of a couple of a couple of safety gates at the kitchen and bathroom doors. Dreambaby® came to our rescue and donated the gates. They have always been wonderful supporters of Playgroup and we are very grateful for all of their support. Dreambaby® is Australia’s leading childhood safety and care brand, offering a wide range of innovative products all designed to help parents and carers raise their children in a safe and healthy environment. This month Essential Baby is giving you the chance to WIN with Dreambaby®. We have six packs, each valued at $41.75, to give away. Visit: Essentialbaby for more information. Dreambaby® is Australia’s leading childhood safety and care brand with a wide range of innovative products all designed to help parents and carers raise their children in a environment. Sunny Coast Kids is giving you the chance to WIN with Dreambaby® starting with these new MUST-have Dreambaby® Anti-Slip Bath Mats range, that are all are easy to install and will make a huge difference to the surface of your bath, with their textured surface designed to help prevent accidental slips and falls. They feature fun colourful animal motifs, including fish, frogs, penguins, starfish and seahorses, all sure to delight your little ones at every bath time! The new Dreambaby® Anti-Slip Bath Mats range includes; Dreambaby® Heat Alert Anti-Slip Bath Mats Dreambaby® Anti-Slip Bath Mats Dreambaby® Anti-Slip Translucent Bath Tub Strips. Entry is subject to Sunny Coast Kids terms and conditions.